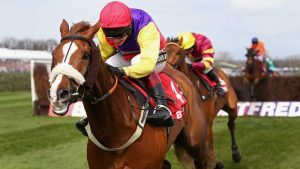 Native River is an Irish bred, British trained horse who specialises in National Hunt races. To be more specific he favours long distance steeplechase events, or rather excels at them. With a positive approach to racing, Native River isn’t afraid to take the lead and dare others to take him on. This isn’t a display or arrogance by horse or jockey, but instead an approach that simply works for a horse with such immense talent, stamina and durability. Native River has shown steady and impressive progress through the years. In 2015/16 he won the Worcester Novices’ Chase and the Mildmay Novices’ Chase. The following year, he’d made leaps and bounds in progress by winning the Hennessy Gold Cup and Welsh Grand National amongst others, and more importantly placing an impressive third in the Cheltenham Gold Cup. The following season he improved yet further in winning the Cheltenham Gold Cup, beating favourite Might Bite into second place. Not bad going for a horse that was bought for €6,000! Despite the price tag, Native River was sired by Indian River who achieved much success in his own right, including a win in the Prix du Président de la République. There’s nothing quite like a racing rivalry, and that is expected to continue between Might Bite and Native River as there are indications that they both have the Chase Triple Crown in their sights. Attaining the Chase Triple Crown involves winning the Betfair Chase, the King George VI Chase and the Cheltenham Gold Cup in the same year. Doing so brings with it a cool £1 million bonus, so who can blaim them for being ambitious.